The Yellowfin Tuna (Thunnus albacares) is designed for speed and endurance. The tuna is the world’s hardest running fish providing the angler with a long and demanding fight. One of the most colorful of the Tuna family, the Yellow fin can reach the weight of several hundred pounds. The maximum however is about 150 pounds. 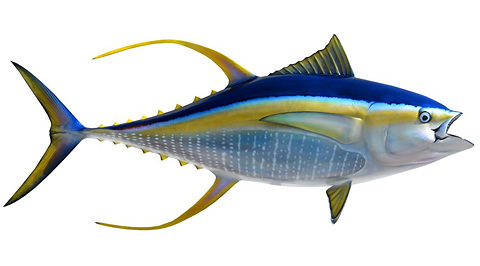 Like other tuna they have football shaped bodies, dark blue or black above with yellow on the sides and fins tinged in yellow with the characteristic yellow finlets. Yellow fin occur in both the Atlantic and Pacific Oceans. Yellowfin Tuna are a highly prized game fish. They are schooling fish and considered of all the tunas commercially. Tuna are pelagic fish that live in the open oceans of this world. Surprisingly the relatively recent addition of deep sea oilrigs has given these open water fish something to relate to even when in 3000′ of water. Schools of tuna will sometime set up residence on the structure for weeks at a time. Tuna are most commonly caught in water at least 500′ deep off the Louisiana coast. There are a few primary ways that these fish are caught. One is by chumming the fish to the boat and then hoping to get one to eat a piece of chum drifted back with a hook in it. Another is to troll baits both natural and artificial behind a boat. Dropping diamond jigs down deep and jigging them up and down with long sweeps of the rod can often produce when the fish are deep and only surface briefly before retreating to the cooler deeper waters. Probably the most exciting way to catch tuna is casting surface popper baits and probably the most efficient method is to slow troll live hard tails behind the boat.